Prevents it from becoming infatuated. 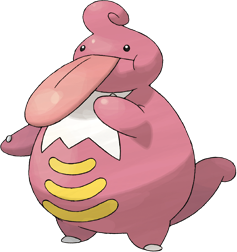 X It wraps things with its extensible tongue. Getting too close to it will leave you soaked with drool. X Es umklammert Dinge mit seiner dehnbaren Zunge. Kommt man ihm zu nahe, wird man eingespeichelt. X Il enroule tout dans sa langue extensible. Ceux qui l’approchent finissent couverts de bave. X Agarra cosas con su lengua extensible. Si te acercas mucho, te deja lleno de babas. X Avvolge ogni cosa con la sua lingua allungabile. Chi si avvicina troppo, si ritroverà tutto bagnato di bava. X 쭉쭉 늘어나는 혓바닥으로 무엇이든 휘감는다. 함부로 다가가면 타액으로 끈적끈적거리게 된다. Y Their saliva contains lots of components that can dissolve anything. The numbness caused by their lick does not dissipate. Y Ihr Speichel enthält eine ätzende Substanz, die bei Kontakt mit der Haut anhaltende Taubheit erzeugt. Y Sa bave anesthésiante est chargée d’une substance capable de faire fondre n’importe quelle matière. Y La alta concentración de sustancias en su saliva lo disuelve todo. Un lametón provoca un entumecimiento permanente. Y La sua saliva contiene una sostanza che scioglie qualsiasi cosa e causa la paralisi se si viene leccati. Y 타액에는 어떤 것도 녹이는 성분이 충분히 포함되어 있어 핥으면 언제까지나 마비된다. Omega Ruby Their saliva contains lots of components that can dissolve anything. The numbness caused by their lick does not dissipate. Omega Ruby Ihr Speichel enthält eine ätzende Substanz, die bei Kontakt mit der Haut anhaltende Taubheit erzeugt. Omega Ruby Sa bave anesthésiante est chargée d’une substance capable de faire fondre n’importe quelle matière. Omega Ruby La alta concentración de sustancias en su saliva lo disuelve todo. Un lametón provoca un entumecimiento permanente. Omega Ruby La sua saliva contiene una sostanza che scioglie qualsiasi cosa e causa la paralisi se si viene leccati. Omega Ruby 타액에는 어떤 것도 녹이는 성분이 충분히 포함되어 있어 핥으면 언제까지나 마비된다. Alpha Sapphire It wraps things with its extensible tongue. Getting too close to it will leave you soaked with drool. Alpha Sapphire Es umklammert Dinge mit seiner dehnbaren Zunge. Kommt man ihm zu nahe, wird man eingespeichelt. Alpha Sapphire Il enroule tout dans sa langue extensible. Ceux qui l’approchent finissent couverts de bave. Alpha Sapphire Agarra cosas con su lengua extensible. Si te acercas mucho, te deja lleno de babas. Alpha Sapphire Avvolge ogni cosa con la sua lingua allungabile. Chi si avvicina troppo, si ritroverà tutto bagnato di bava. Alpha Sapphire 쭉쭉 늘어나는 혓바닥으로 무엇이든 휘감는다. 함부로 다가가면 타액으로 끈적끈적거리게 된다. Diamond It wraps anything with its rapidly extending tongue. One who approaches it carelessly may result in getting covered in its sticky saliva. Pearl It wraps anything with its rapidly extending tongue. One who approaches it carelessly may result in getting covered in its sticky saliva. Platinum The long tongue is always soggy with slobber. The saliva contains a solvent that causes numbness. 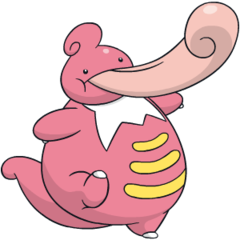 SoulSilver It has space in its throat to store saliva. It can also roll up its tongue and store it in the same spot. Black The long tongue is always soggy with slobber. The saliva contains a solvent that causes numbness. White The long tongue is always soggy with slobber. The saliva contains a solvent that causes numbness. White 2 Their saliva contains lots of components that can dissolve anything. The numbness caused by their lick does not dissipate.